This Delicious Shrimp Scampi Cooks In A Matter Of Minutes! We were in the mood for this fantastic shellfish, and we wanted to keep it nice and simple. Heat a skillet over high heat until hot. Add 1 tablespoon oil and swirl to coat the bottom of the pan. Add half the shrimp and cook, stirring occasionally until just opaque (about 1 minute). Transfer to a medium bowl. Return the pan to the heat and repeat with the remaining oil and shrimp. Return the empty skillet to medium-low heat. Melt 1 tablespoon butter. Add the garlic and shallots and cook, stirring constantly until fragrant (about 30 seconds). Off heat, add the lemon juice, vermouth, and red pepper flakes. Whisk in the remaining 2 tablespoons butter, add parsley and season to taste with salt and pepper. 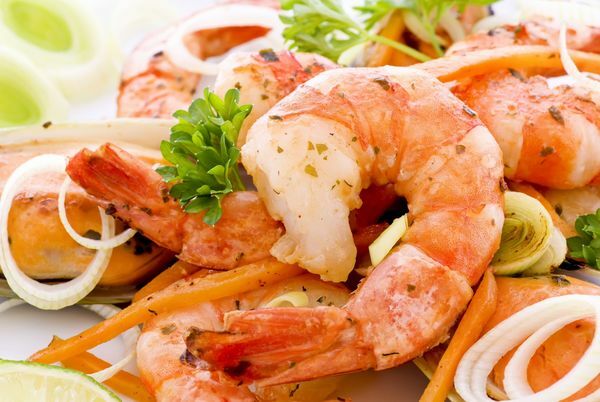 Return the shrimp and any accumulated juices to the skillet. Toss to combine. Serve immediately.